One in three people in an often-cited study could not come up with $2,000 cash within 30 days. When out-of-pocket expenses exceed 10 percent, large swaths of adults start reporting they were contacted by a collection agency, changed their way of life to pay medical bills, or went without medical care due to the cost. Commonwealth said the chief culprit is increasingly pervasive high-deductible health plans in ACA and private insurance plans, which require people to pay all of their medical costs upfront until they hit a specified dollar amount, for example $3,000 annually. “People with employer plans are seeing costs shifted to them as they are paying higher deductibles and more out-of-pocket for health care,” said Sara Collins, a Commonwealth vice president. Premiums, on the other hand, are relatively stable. Rising deductibles are really starting to bite, forcing those without savings to turn to their credit cards to pay for high-cost medical services. Commonwealth’s Fund study is one of several recently that corroborate this particular financial strain. The findings are very similar to a study by another health care organization, the Henry J. Kaiser Family Foundation. A JP Morgan study found that cash-strapped people frequently use the infusion of cash from their tax returns to pay large medical bills. 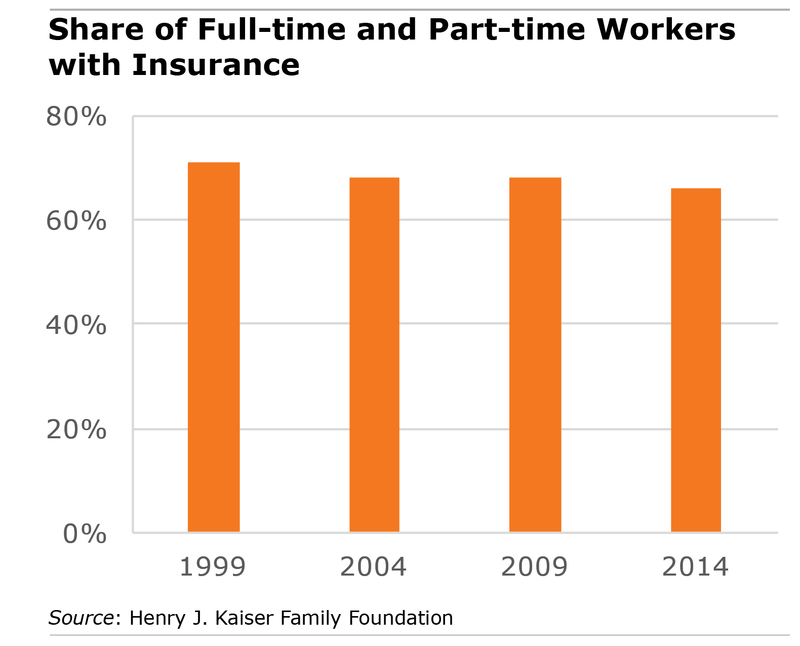 Lower-income workers always feel the brunt of expensive health care. But affordability is a growing issue for the middle class. Increasingly, we are becoming a society of have and have-nots. Another hit to the wedge dividing our country. Self employed, contract employees and employers not providing medical benefits cause the lower wage earners to fend for themselves for healthcare and is creating a disparity among Americans. This article unfairly paints high deductible health insurance policies in a negative way. When the MSA (Medical Savings Accounts) first came out roughly 18 years ago, the traditional health insurance that I was paying for my very young family of 5 was $473/month. The MSA premium was only $173 for a $5,500 family deductible. I was happy that I could keep that $300 monthly savings in an account for my own use instead of giving it to the insurance company. We rarely spent $300/month on medical services. As perspective in the last 24 years we hit our deductible 4 times. Three times because of a child breaking a bone and once because of an issue that I went through. Our family made out to the good 20 out of 24 years by paying the low premium, personally benefitting by paying for less health insurance and pocketing the savings. This is an alternative perspective to your presentation of being underinsured. For the life of me, I cannot understand why Americans aren’t SCREAMING about this issue and holding politicians feet to the fire. Our system is broken, broken, broken. Perhaps seeing this is too difficult a stretch for those in office with gold-plated health benefits. In CT, the health care insurance for state employees is so good that our federal officials choose it over their own federal health plans. Have and have-nots is right!!! Get rid of the profit and overhead in our so-called “free market” health system (which is neither competitive nor transparent) and switch to a single-payer system. How can it get any worse? If high-deductible health plans are desirable — and they may well not be — it is vital to have health savings accounts. I agree that high deductible plans are great – I had one for years and I am a doctor myself – but only if you are healthy and if you can pay the deductible if you occasionally hit it. However, what Chris above doesn’t see (and the article doesn’t make clear) is that a lot of people who cannot afford a high deductible choose such a plan anyway precisely because the premiums are lower. These may be less healthy people who will predictably hit the deductible every year, but they see no alternative. My carpenter is an excellent example – one hernia surgery and he was in no-pay land. As for having an HSA with your high deductible plan, that only works if you have enough excess cash to contribute to the HSA. Many families live paycheck to paycheck and cannot fund an HSA. In truth, these plans benefit the upper middle class only. Recent numbers show 178M people covered through the public/private sector employee, 62M covered through Medicaid, 52M through Medicare, & 18M individual, leaving 11M getting ACA coverage (85% of whom get subsidized coverage). This is why affordable (unsubsidized) coverage is impossible for us to attain (without a significant increase in federal taxes). With most of the nation having subsidized coverage through either (1) the government (at various levels) or (2) the private sector (medium/large companies), covering workers/retirees/indigent, it’s economically impossible to insure the 10%-15% remaining population without tremendous subsidies. (The market demands it.) That’s why you’re seeing $1,135 unsubsidized premiums in the ACA rather than $135 premiums. It can’t be done without the same huge tax increases we see in other countries that have universal coverage (and other unlimited social safety net programs). I can only speak from experience. I used to work for Boston College. They are a great employer, and have a low deductible health plan with modest premiums. My new employer offers a HDHP. The premiums are lower and my employer contributes to the HDHP. The saving is so large that I would come out ahead even if I maxed out my deductible – a story confirmed by a recent Times article. It sounds as if the people in the study are not following the HDHP instructions. They are trousering the lower premiums, not contributing to the accompanying HSA, and then complaining when some out of pocket expenses come along. That’s not to say there aren’t problems with ACA policies. But that is another story. Obamacare/ACA is fine for truly poor people — individuals earning up to about 200% of the poverty line. But it is a disaster for individuals earning anything more than that, and who must buy insurance in the individual market. The problem with Obamacare for this group is that it forces us to buy overpriced private insurance even if we can’t afford it, and with little or no governmental subsidy. Obamacare created high coverage standards for policies, and necessarily so, since universal coverage only works if standards exist to ensure that coverage really means coverage. Still, people of moderate income are caught in a terrible bind — forced to buy policies designed up to a high standard in the world’s most expensive healthcare system, yet left to pay for them on their own, without any help. You may say “Well, middle-income people shouldn’t need help — aren’t they middle income after all?” And when it comes to housing, clothes, cars, etc., there are options available for middle-income people. Even most financial services are flexible; people buy whatever life insurance they can afford. It’s up to them. But not in healthcare. My son and I are expected to afford premiums of $915/month, with $1,500 deductibles each. My wife’s insurance costs us another $260/month. This totals $14,000 a year, just for premiums. With costs and premiums like this, the HI-deductible/HSA eligible policies do not help us. The ACA’s generous subsidies for the truly poor are a godsend to them, I’m sure. The lack of sufficient subsidies for middle-income people in the individual market is driving many of us into old-age poverty. Single-payer healthcare is the answer! We’ll never know how ACA might have performed with a sufficiently enforced mandate. Health insurance and their respective premiums need to be more transparent. My large fortune 500 employer is self-insured. Unfortunately, we live in a high-priced coastal community with lots of retirees on Medicare and large number of public employees. Their low-cost premium structure is supplemented by the much higher cost private market. Our annual premiums for two people in their 60’s is $9,425 per year. Our deductible is $1,100 per person in the network with a max out-of-pocket per person in network copay of $4,700 per person. The out-of-network deductible is higher. We have only met our deductible twice in 23 years. Prices are spiked by a large number of snow birds who have major surgery here in the winter but their supplemental plan F does not support our local market. 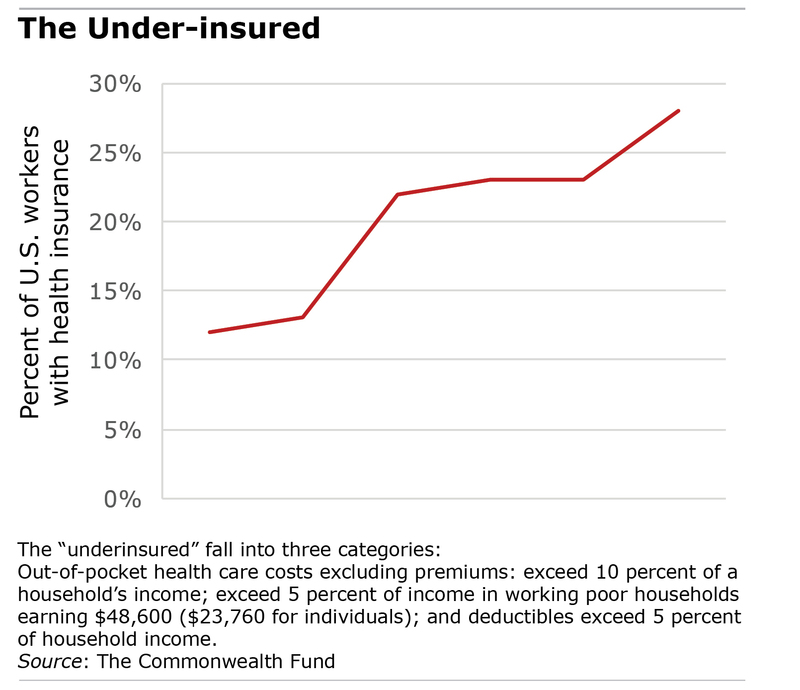 A high number of uninsured and disabled also contribute to pricing pressure. Health care costs will continue to rise uncontrollably until you have a single payer for all health care structure and the community-based for “profit” health care system is publicly scrutinized. Our Congress needs to concentrate on impute costs. They could start by making medical school free, move to a European medical school style system, and change the tax status of physicians. High debt and high marginal tax rate forces most physician groups to dream up ownership based LLC structures, which just adds to the cost. What’s needed are immediate, practical ways to make care affordable through patient financing programs. Like it or not, healthcare is increasingly a major purchase for people and we should treat it as such. That means enabling people to pay for medical services over time. Long-term financing sources would help people get the care they need while doctors, hospitals and other providers stay financially solvent as they continue to look after their communities’ well-being.